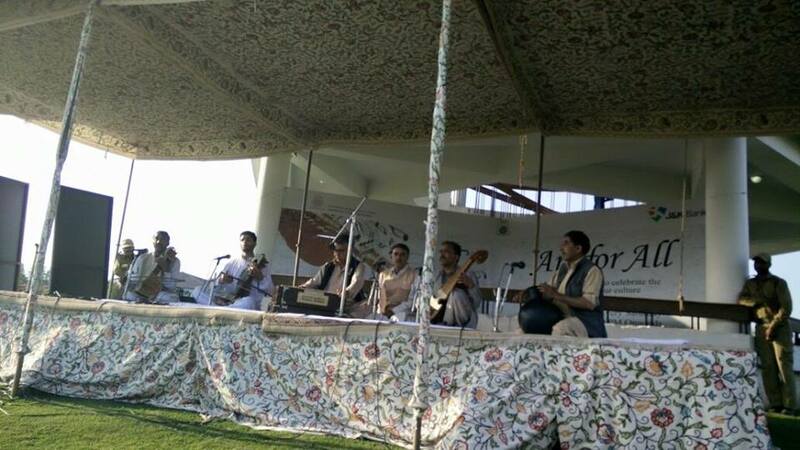 Sufi poetry buffs thronged the historic Iqbal Park in Srinagar Saturday evening where the blend of Abdul Rashid Hafiz’s voice and Samad Mir’s poetry enthralled audience for almost three hours. The program was organized by department of culture with the help of Jammu and Kashmir Bank in continuation with its initiative: “Art for All”. Attended by a modest gathering, the program started with Sarang by Abdul Gani Parray followed by couple of Ghazals. After Parray, legendary Sufi singer Abdul Rashid Hafiz engaged audience by singing famous poetry of Samad Mir. Born at Old Srinagar’s Narwara area in the year 1894, Samad Mir belonged to a Sufi family. At the age of 20, Mir decided to return to Nambalhar, his ancestral residence. He died at the age of 65 in the year 1959. With huge response from the audience, Hafiz was compelled to sing four Ghazals at a stretch. While commenting on the initiative of ‘musical evenings’, Zubair Ahmad who had come from South Kashmir to attend the event excalimed, “This is soothing! “Atleast, we have some place to relax and breathe away from the maddening crowd,” he asserted. “It is being done in a different way to bring out the richness of the our culture through theme-based programmes by dedicating evenings to legendary poets, musical instruments and poetic genres. The objective of this distinctive series of programmes is also to promote creative theatrical expression and artistic enrichment,” Minister for Finance, Culture and employment Dr Haseeb Drabu is quoted to have said. Under this initiative, a series of programmes are being organized at Public Parks and places in Srinagar. As a part of this initiative, Department of Culture is organizing next musical evenings at Badam Vaer, Srinagar on June 7, to celebrate the legacy of another famous poet Mehmood Gaami.